... VIEWING RECOMMENDED ... RARE TO MARKET ... Arguably one of the most sought after streets in Heaton, Everlsey Place is home to this superb 3 bedroom mid terrace house. The property offers a pleasing blend of traditional features and high quality fixtures and fittings. The well appointed accommodation comprises: entrance porch, entrance hall, lounge, dining room and breakfasting kitchen. To the 1st floor there are 3 good size bedrooms, a bathroom and a separate WC. Additional benefits include gas central heating and double glazing. Externally, there is a front garden and a South West facing rear yard. Double glazed bay window to the front, fitted gas fire, alcoves, telephone point, television point, coving to ceiling, ceiling rose, double radiators and solid oak flooring. Double glazed window to the rear, alcoves, coving to ceiling, ceiling rose, double radiator and solid oak flooring. Fitted with a range of wall & base units, work surfaces, 1 ½ drainer sink unit, built in Bosch electric oven, built in Bosch gas hob, space for an automatic washer, space for an automatic dishwasher, part tiled walls, double glazed window to the side, double glazed door to side, sky light, LED spotlights and Amtico flooring. : Fitted with a range of wall & base units, work surfaces, 1 ½ drainer sink unit, built in Bosch electric oven, built in Bosch gas hob, space for an automatic washer, space for an automatic dishwasher, part tiled walls, double glazed window to the side, double glazed door to side, sky light, LED spotlights and Amtico flooring. Entrance door, under stairs cupboard, double radiator, dado rail and solid oak flooring. Sky light, access to roof space via loft ladder, dado rail, part carpet and part Karndean flooring. Double glazed window to the front, alcoves, coving to ceiling, double radiator and carpet. Double glazed wundow to the front, double radiator and laminate flooring. 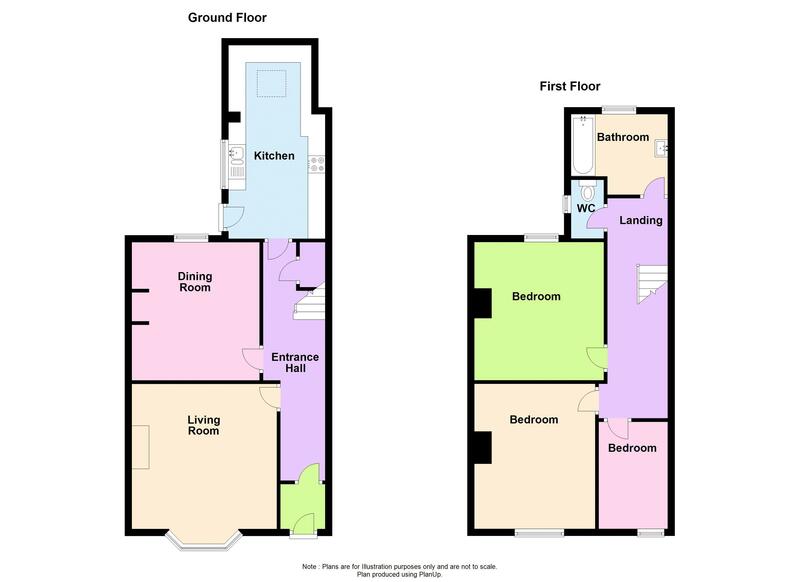 White 2-piece suite comprising paneled bath with mains shower over, wash hand basin, part tiled walls, heated towel rail, double glazed frosted window to the rear, halogen spotlights and Karndean flooring. Low level w.c,, part tiled walls, double glazed frosted window to the rear, halogen spotlights and Karndean flooring.